Lustraloy Cap and Barrel (stainless steel) with gold filled bands and clips. Sold by Parker as the “Flighter”. Brushed finish. The later version eliminated the gold bands. Late production Lustraloy Cap and Barrel (stainless steel) with gold filled clips, ca. 1957. 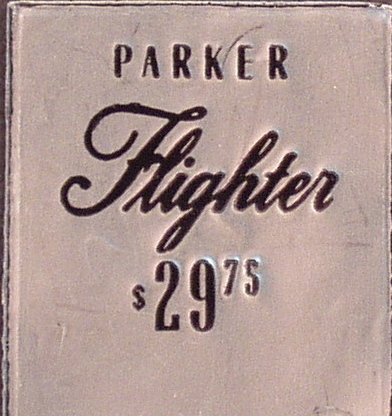 Sold by Parker as the “Flighter”. Brushed finish. The earlier version had gold bands. Caps are unique to this pen and are of a unique design. 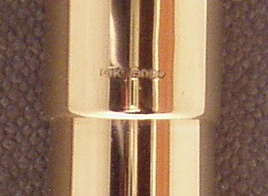 The cap lip was removed, as in much later versions, but the inside clutch was still of the “window” style. No halo logo on caps. Sterling Silver Cap and Barrel with chrome clips. Canadian production. Design is of tapered lines. This version was never made in the U.S. Rumors exist of a fountain pen version. There is an almost identical-looking version Made in England, but those are marked as RSilver or rolled silver, essentially silver plate. Gold Filled Cap and Barrel with gold filled clips. Sold by Parker as the “Signet” and later renamed the “Insignia” Available in both Full size and Demi size. Unique design of 3 parallel lines spaced evenly. Available with ‘clicker” and Liquid Lead pencils. All Gold Filled Cap and Barrel with no clip and encrusted “jewels” on cap and barrel ends. Smooth pattern, with no design. Sold by Parker as the “Princess”. A very limited production model, ca. 1955. 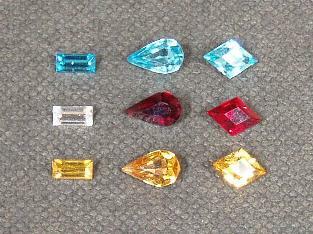 Made in several versions with different “jewel” colors and shapes. Also had a unique box design, completely covered in velvet, inside and out. Gold filled cap with rainbow pattern. Parker experimented with this pattern before the Parker 61 came out. It found the production to be too difficult and costly and did not proceed with it at the time. There is a full version of cap and barrel in the rainbow pattern. Solid 14k Gold Cap and Barrel with 14k clip. 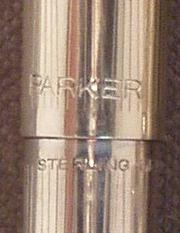 Sold by Parker as the “Presidential”. Smooth design with no pattern, suitable for engraving/dedication. Only available in full size. 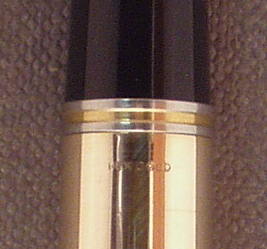 Later version had a gold filled clip. A unique leather presentation box was designed for this pen. 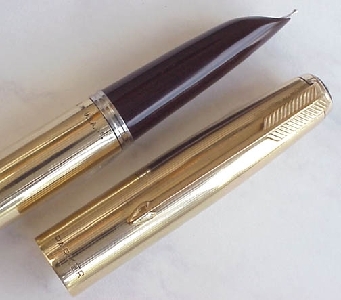 A matching pencil was available in “clicker” or Liquid Lead models. Other “Presidential” versions are available from the UK and South America in a variety of gold contents, but the U.S. version was only in 14k, and is the hardest to find. Parker Aerometric Full Sized Lustraloy (stainless steel) cap with chrome plated clip. These caps had a matte finish with a brushed thin lip. Finish was more “brushed” than the earlier caps. The finish did not stand up to wear too well and quickly wore off. Parker Aerometric Full Sized Lustraloy (stainless steel) cap with chrome plated clip. These caps had a matte finish with no lip. Finish was more “brushed” than the earlier caps. The finish did not stand up to wear too well and quickly wore off. Gold Filled cap and gold filled clip. These very late production caps had “51” added to the cap lip. Available in fountain pen, pencil and ballpoint pen. Solid 18kt gold cap and barrel “51” in twisted cable pattern. Made by Cartier.